If you’re looking for a safer, more comfortable alternative to a standard tub, a walk in bath tub could be the perfect solution for your home in Acworth, Georgia. Walk in tubs are becoming quite popular due to their unparalleled combination of modern style, safety, and luxury. Plus, if you struggle with painful joints or your mobility is limited in another way, you’ll find that bathing in a walk in tub is much easier to manage than in an ordinary tub. Easy entry – Our tubs have low thresholds only a couple of inches high and secure, leak-proof doors, so you literally can just walk right in. Twice the depth of standard tubs – This allows the built-in seats to be at the optimum height for reducing joint strain. You’ll be able to relax in the bath while sitting comfortably at chair height. Safety features – The chances of slipping and falling in the tub are significantly reduced with grab bars, slip-resistant surfaces, and side grips. Convenient controls – Your tub’s controls will be easy to reach and operate from the built-in seat. You may also choose to upgrade to a luxurious therapeutic tub. Our hydrotherapy tubs use underwater air jets for a relaxing massage, aromatherapy tubs release scented beads into the water for calming fragrances, and chromatherapy tubs display color-changing underwater lights. Therapy tubs are helpful for reducing stress and can also provide temporary relief for various medical symptoms, such as aching muscles or stiff joints. Please contact us today to learn more about installing a walk in bath tub in your Acworth, GA, residence. 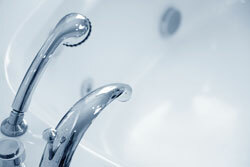 We’ll be happy to answer your questions and help you find the right walk in tub for your needs.